Emily V. Gordon (born May 3, 1979) is an American writer, producer and podcast host. She co-wrote the 2017 romantic comedy film The Big Sick, based on her relationship with her husband and frequent collaborator, comic Kumail Nanjiani. Gordon and Nanjiani won an Independent Spirit Award for Best First Screenplay for The Big Sick; they were also nominated for a 2018 Academy Award for Best Original Screenplay, among many other nominations. Gordon began her career as a family and couples therapist before becoming a writer and comedy producer. She co-created the live show The Meltdown with Jonah and Kumail and its television counterpart for Comedy Central, and has written for television (The Carmichael Show), a book (Super You), and for several online and print publications. Gordon was born and raised in Winston-Salem, North Carolina. She received a BA in psychology from the University of North Carolina at Greensboro and an MS/EdS in couples and family counseling from the University of North Carolina at Greensboro. Gordon was a practicing therapist from 2004 to 2009, working in North Carolina; Chicago, Illinois (where she moved in 2005); and Brooklyn, New York (where she moved in 2007). Gordon began her comedy career in New York, where she worked at Comix comedy club and produced a live show with Pete Holmes. By the time she moved to Los Angeles in 2010, Gordon was pursuing comedy and freelance writing full-time. Gordon has written two webseries aimed at teenagers, called Power Up and ExploreD, at Disney.com. She wrote for the second season of The Carmichael Show on NBC, writing an episode called "New Neighbors". In addition to writing, Gordon also produces comedy. 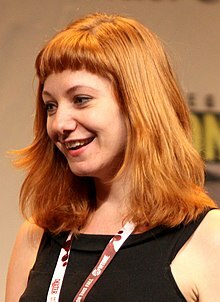 In 2010, she created a weekly live show co-hosted by Jonah Ray and Kumail Nanjiani called The Meltdown with Jonah and Kumail, located in the back of comic bookstore Meltdown Comics; Gordon served as producer and booker. In 2011 she was asked by Chris Hardwick, who wanted to turn the space into a curated comedy venue, to act as program director. She served as program director of the Nerdist Showroom at Meltdown Comics from 2011 to 2012. In 2013 Comedy Central ordered a pilot for The Meltdown with Jonah and Kumail, which was made a series in 2014; Gordon was an executive producer. Gordon and Nanjiani co-host a Nerdist network podcast called The Indoor Kids, which "isn't just about video games, but it isn't not about video games." Gordon is signed to adapt Cynthia D’Aprix Sweeney 2016 novel The Nest for Amazon's film studio. Jill Soloway and Andrea Sperling will produce the feature film. Gordon's first book, Super You: Release Your Inner Superhero, a tongue-in-cheek self-improvement guide, was released in 2015. Gordon also co-wrote the screenplay of and co-executive produced the 2017 film The Big Sick, with her husband Kumail Nanjiani. The critically acclaimed film is based on the beginning of their relationship, with Nanjiani playing himself, and Gordon (renamed Emily Gardner) played by Zoe Kazan. The Big Sick was directed by Michael Showalter and produced by Judd Apatow. Gordon and Nanjiani's script won the Independent Spirit Award for Best First Screenplay. It was also nominated for a 2018 Academy Award for Best Original Screenplay, as well as screenwriting awards from the Writers Guild of America, the Gotham Awards, and a dozen critics' associations. Gordon has been married to actor and comedian Kumail Nanjiani since 2007. It is her second marriage. She met Nanjiani at a comedy show in Chicago where he was performing; she lightly heckled him, an encounter depicted in The Big Sick. In the ensuing months, they began dating but Gordon fell seriously ill and was put into a medically induced coma before being diagnosed with Still's disease. Gordon recovered and three months later — twelve months after meeting — they married. They previously lived in Chicago and New York, but later moved to Los Angeles. ^ a b c Clodfelter, Tim (July 12, 2017). "Love and Laughs: Movie follows relationship between Winston-Salem native and comic". Winston-Salem Journal. Retrieved January 24, 2018. ^ Gordon, Emily V. (May 3, 2017). "Wanna celebrate my birthday? Donate blood or time/money to @ghettorescue @SowMuchGood @TheSiweProject @PatriotsandPaws @Translifeline !". Twitter. Retrieved February 16, 2018. ^ a b c d Pitchel, Samantha (July 22, 2014). "The Inside Story of The Meltdown with Jonah and Kumail". Splitsider. Retrieved January 24, 2018. ^ a b Martin, Garrett (June 30, 2015). "Talking The Meltdown With Jonah Ray and Emily Gordon". Paste. Retrieved January 24, 2018. ^ Marechal, AJ (June 20, 2013). "Comedy Central to Have a 'Meltdown'". Variety. Retrieved January 24, 2018. ^ a b Dowd, A.A. (June 23, 2017). "Kumail Nanjiani and Emily V. Gordon on turning crisis into comedy for The Big Sick". The A.V. Club. Retrieved January 25, 2018. ^ "The Indoor Kids". nerdist.com. Retrieved January 24, 2018. ^ Hipes, Patrick (January 24, 2018). "'The Big Sick' Co-Scribe Emily V. Gordon To Adapt 'The Nest' For Amazon". Deadline. Retrieved January 25, 2018. ^ Lane, Carly (October 1, 2015). "Interview: Author Emily V. Gordon on Finding Your Super You and Taking Control of Who You Are". The Mary Sue. ^ Galentine, Kellie. "5 Ways To Embrace Your Inner Superhero - Without A Cape". Bust. Retrieved January 24, 2018. ^ Winfrey, Graham (January 22, 2017). "Amazon Wins 'The Big Sick' Bidding War $12 Million Buy Sundance 2017". IndieWire. Retrieved May 8, 2017. ^ a b THR Staff (March 3, 2018). "Kumail Nanjiani & Emily V. Gordon Win Best First Screenplay for 'The Big Sick' | 2018 Film Independent Spirit Awards". The Hollywood Reporter. Retrieved March 5, 2018. ^ Ernsberger, Parry (January 23, 2018). "Kumail Nanjiani Congratulated Emily V. Gordon On Her Oscar Nomination With A Sweet New Nickname". Bustle. Retrieved January 24, 2018. ^ a b McNary, Dave (January 4, 2018). "Writers Guild Awards: 'Get Out,' 'Call Me by Your Name,' 'Lady Bird' Nab Nominations". Variety. Retrieved January 4, 2018. ^ a b Erbland, Kate (October 19, 2017). "'Get Out' Leads 2017 Gotham Awards Nominations". Variety. Retrieved October 19, 2017. ^ a b c d Marantz, Andrew (May 1, 2017). "Kumail Nanjiani's Culture-Clash Comedy". The New Yorker. ISSN 0028-792X. Retrieved January 24, 2018. ^ Gross, Terry (July 12, 2017). "How A Medically Induced Coma Led To Love, Marriage And 'The Big Sick'". Fresh Air. NPR. Retrieved January 25, 2018. ^ Marie, Jane (May 20, 2014). "The Secret Life of Marrieds: Why We Kept Our Marriage Secret for Years". Cosmopolitan. Retrieved May 5, 2017. ^ Press, Associated (January 23, 2018). "List of nominees for the 90th annual Academy Awards". Washington Post. ISSN 0190-8286. Retrieved January 24, 2018. ^ Neglia, Matt (December 30, 2017). "The 2017 Austin Film Critics Association (AFCA) Nominations". nextbestpicture.com. Retrieved December 30, 2017. ^ Childress, Erik (December 10, 2017). "'Call Me By Your Name' and 'The Shape of Water' lead 2017 Chicago Film Critics Association Nominees". Chicago Film Critics Association. Archived from the original on December 13, 2017. Retrieved December 10, 2017. ^ Childress, Erik (December 12, 2017). "'Lady Bird,' 'Call Me By Your Name' win big for Chicago film critics". Chicago Film Critics Association. Archived from the original on December 13, 2017. Retrieved December 12, 2017. ^ Tapley, Kristopher (December 6, 2017). "'Shape of Water' Leads Critics' Choice Film Nominations". Variety. Retrieved December 6, 2017. ^ "The 2017 Detroit Film Critics Society Awards Nominations". Detroit Film Critics Society. December 4, 2017. Retrieved December 15, 2017. ^ Darling, Cary (December 12, 2017). "'The Shape of Water' inundates Houston critics' film awards nominations". Houston Chronicle. Retrieved December 12, 2017. ^ "2017 San Diego Film Critics Society Award Winners". San Diego Film Critics Society. December 11, 2017. Archived from the original on December 12, 2017. Retrieved December 11, 2017. ^ "2017 San Francisco Film Critics Circle Awards". San Francisco Film Critics Circle. December 10, 2017. Archived from the original on December 11, 2017. Retrieved December 10, 2017. ^ "'Blade Runner 2049' Leads the 2017 Seattle Film Critics Society Nominations" (Press release). Seattle, WA: Seattle Film Critics Society. December 11, 2017. Archived from the original on December 12, 2017. Retrieved December 12, 2017. ^ "The 2017 WAFCA Awards: 'Get Out' Is In with D.C. Film Critics" (Press release). Washington, D.C.: Washington D.C. Area Film Critics Association. December 8, 2017. Archived from the original on December 9, 2017. Retrieved December 8, 2017. Wikimedia Commons has media related to Emily V. Gordon. This page was last edited on 25 December 2018, at 03:57 (UTC).